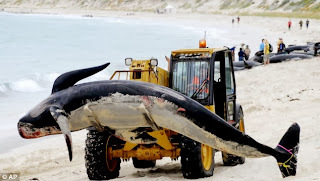 "A TRUE 'EXTRA-TERRESTRIAL INTELLIGENCE' "
"We cited a study about dead carcasses, where controlled release offshore ofdead carcasses only yield to 8% of carcasses actually washing ashore. So what we see on our shores is a tiny fragment of what is going on. 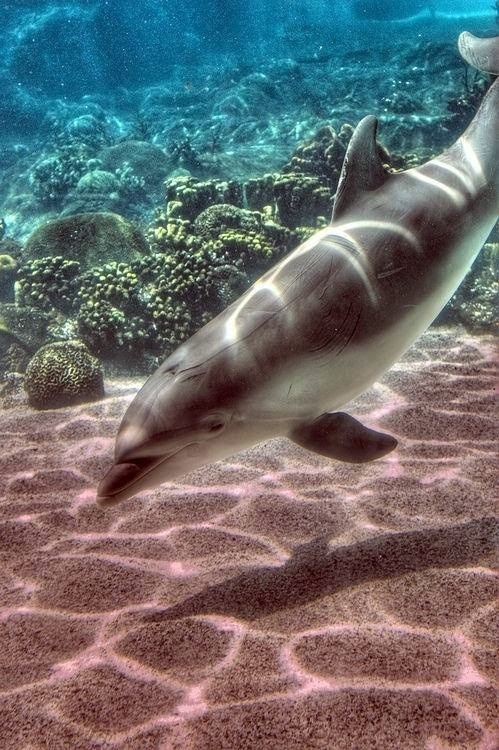 That is why we believe so strongly that every live stranded cetacean is a miracle that went through hell to stay alive and because of that should be given any help imaginable to survive." 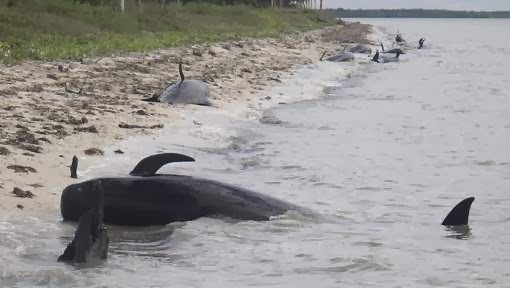 End of day update: 51 short finned pilot whales in Everglades, FL, first reported 12/3/13 around 2:30 pm ET by park rangers. 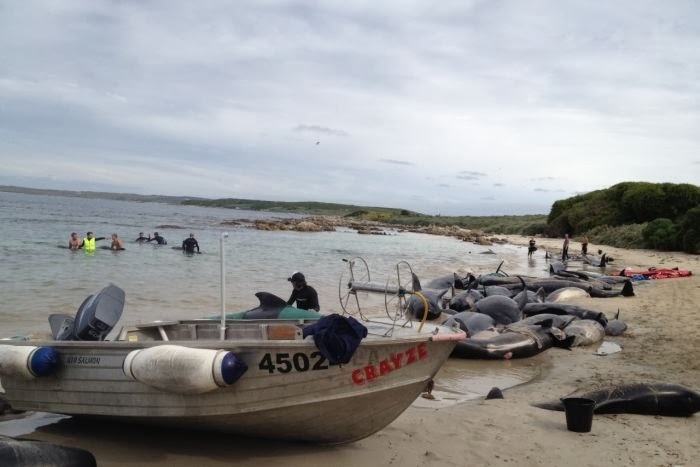 Today NOAA rescued exactly 0 whales, but managed to euthanize 4. 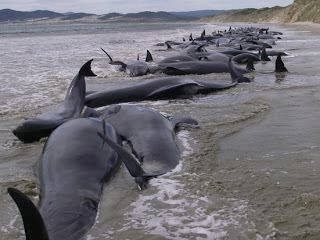 Around 41 whales still alive, no actions will be taken tonight. 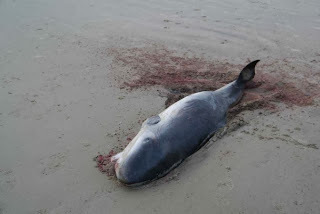 NOAA hopes whales die overnight, if not, tomorrow morning they will start a massacre. It does not look like they will be attempting any sort of rescue tomorrow. Over and out. "In order to appreciate the future of undersea warfare, it is necessary to understand some aspects of the current state of the oceanographic sciences and their development. In no other field of warfare does the environment enter in so complex a way to fashion and fix the character of the operations. The classical example is that of biological intervention. In the air and on the ground the intervention of an animal or plant in military operations is rare and noteworthy. In the sea, freedom from such interference - by organisms that reflect sonar pulses, for example - would be extraordinary." 'Militarized Oceans' by William A. Nierenberg, chap. Unless Peace Comes, ed. Nigel Calder, 1968. "Killing With Sound: What Happens When the Whales Stop Singing?" Close your eyes. Your world is now only sound -- the rain, the traffic, that far-off siren. In this acoustic world, how you navigate, find food, your children, or mate, all depends upon how well you hear. Imagine that as you search in the darkness for a crying child, a horrifying drone, loud as a rocket, suddenly blasts sound pulses like shock-waves through your home. There are no noise-cancelling headphones to stop the U.S. Navy's 235-decibel pressure waves of unbearable pinging and metallic shrieking. At 200 Db, the vibrations can rupture your lungs, and above 210 Db, the lethal noise can bore straight through your brain until it hemorrhages that delicate tissue. If you're not deaf after this devastating sonar blast, you're dead. This is the real life of marine mammals destroyed by the U.S. Navy's all-out acoustic war on the world's oceans. The collateral damage of this high-intensity military sonar is shocking. 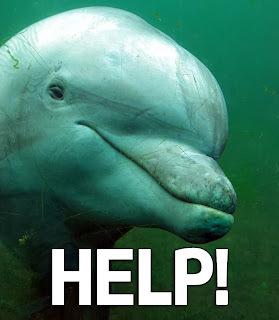 But because all these millions of dying whales or dolphins are too often out of human sight, they're also out of mind. 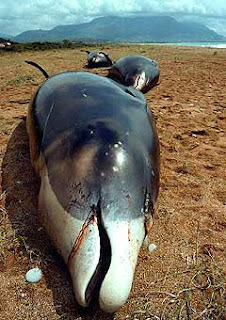 Only when cetaceans strand on land do we witness what orca researcher, Ken Balcomb, calls, this "acoustic holocaust." 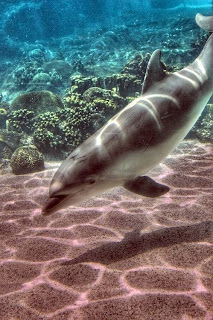 Military sonar so panics cetaceans that as they try to escape the sonic violence, they rise too quickly to the surface and die of "the bends." Scientific American calls military sonar, 'rolling walls of noise.' 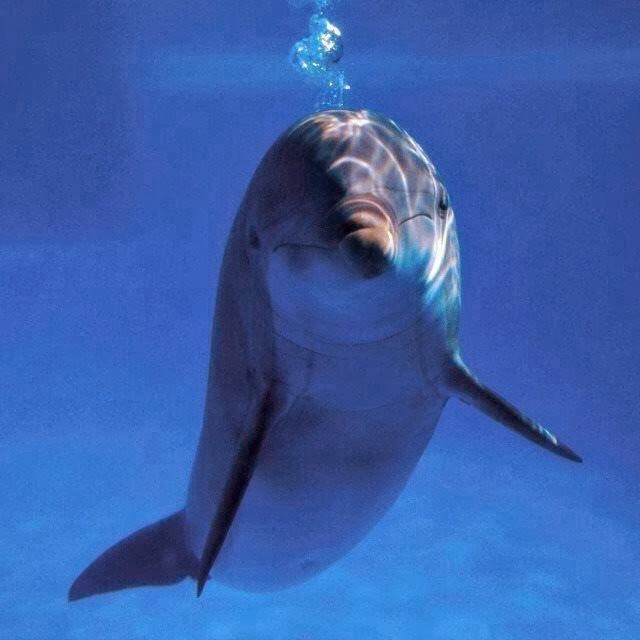 For the dolphins, whom researchers have documented as "self-aware," noting that they "call each other by name," this is a brutal and inhumane death sentence. 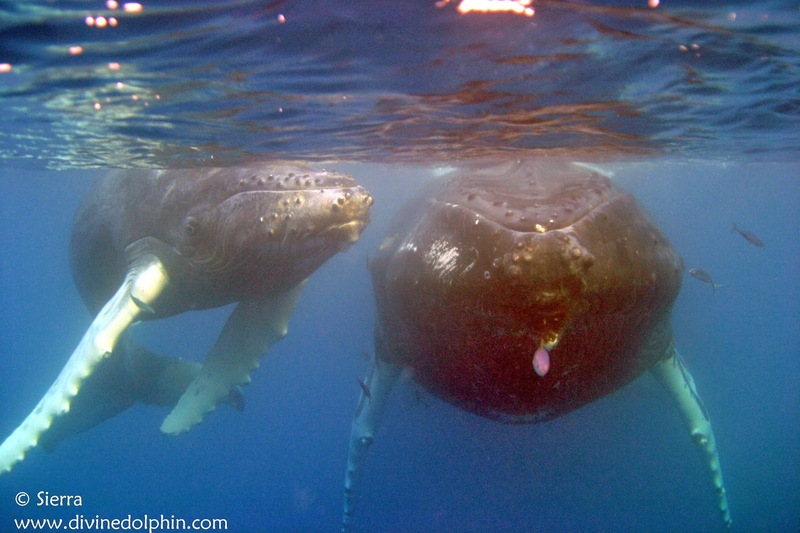 For whales, such as the great blue, who can communicate over thousands of miles, such sonic stress affects reproduction and communication so much that some whales simply stop vocalizing. What happens to our oceans when the whales stop singing? 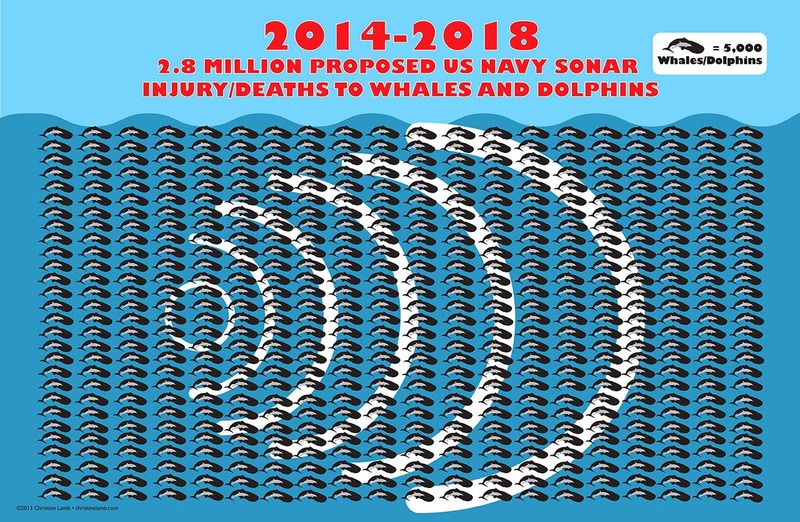 In the Navy's latest environmental impact statement draft, they admit that the sonar exercises planned for 2014-2018 may unintentionally "harm marine mammals 2.8 million times over five years." This estimate is up about 150,000 instances a year from their EIS statement of 2009-2013. Included in this estimate are two million incidents of "temporary hearing loss," and 2,000 are targeted for permanent hearing loss. 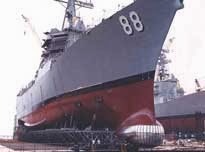 Criticism of the Navy's sonar has intensified, even as the military has intensified their sonar tests.The main concern of scientists and environmentalists is that the Navy has not done enough environmental impact research and knows much too little about the devastation they're unleashing on our marine environment to proceed with such expanded target ranges. The Navy has paid little heed to the scientists, the lawsuits, the public outcry, and the many media storms all protesting this risky technology. 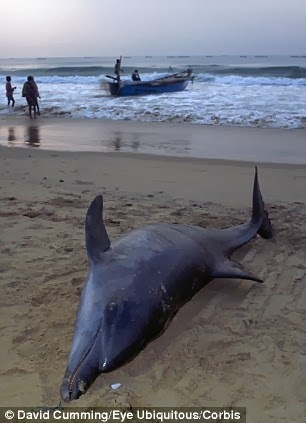 Even while sometimes admitting sonar's role in mass strandings -- like those in the Bahamas, Canary Islands, Pacific Northwest, Greece, and North Carolina -- the Navy has proceeded to garner federal permits to expand their sonar tests. 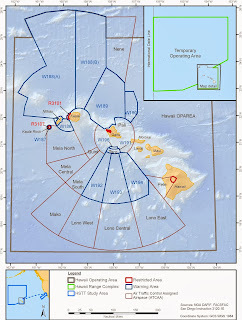 NMFS (National Marine Fisheries Service) just gave the Navy the go-ahead for their proposed 2014-2018 sonar exercises, targeting those two million whales and dolphins. 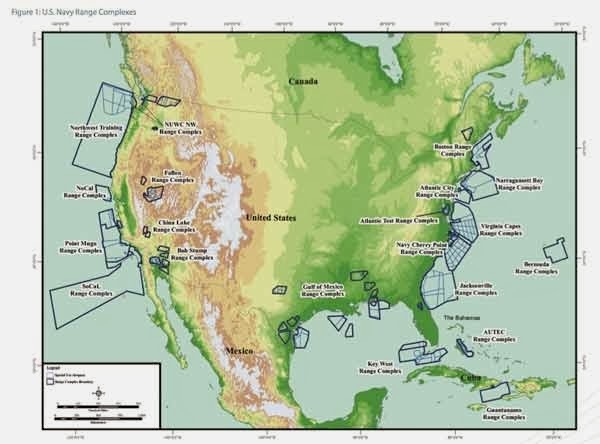 In response, the NRDC (Natural resources Defense Council) and Earth Justice, along with several tribes have brought a lawsuit claiming that NMFS was "wrong to approve the Navy's expanded training plan," which would affect Washington, Oregon and California coasts. The Navy has agreed only to post look-outs onboard ships to spot whales. "Visual detection can miss anywhere from 25 to 95 percent of the marine mammals in an area," says Heather Trim, Director of Policy for People for Puget Sound. 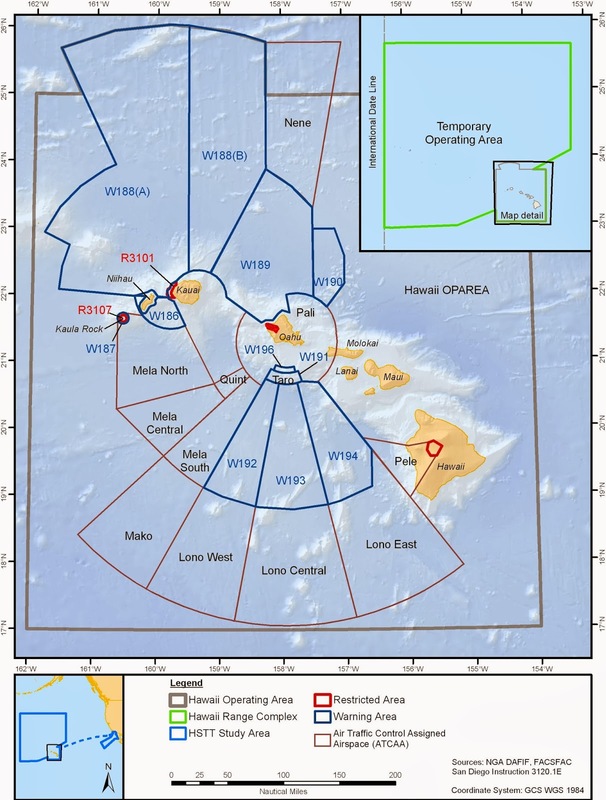 The Navy should at least use common-sense precautions: declare whale sanctuaries, birthing nurseries, and whale migration paths off-limits to sonar testing. 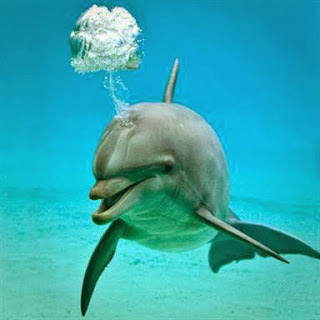 The Navy could employ their sophisticated listening devices to make sure no cetaceans are in the path of their lethal sonar. Finally, the Navy could engage in a serious and thoughtful dialogue with scientists and environmentalists about how to assure our military readiness while not destroying the very ocean they supposedly serve. As we now ponder cuts to the defense budget, why not stop this military sonar's expansion until we have enough sound science and environmental research to use it judiciously and with much greater concern for all life? In this time of collapsing fisheries and disastrous marine pollution, when our oceans are more fragile and endangered than ever before, why let the Navy blast its expensive and fatal sonar through our seas? We must not let our fear of some supposed enemy destroy our foresight. 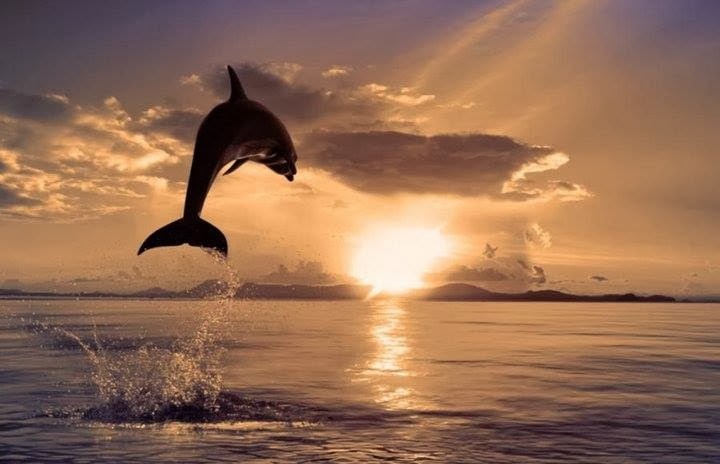 The tragedy is that in our zeal to protect ourselves, we are destroying the same life support system that we need for our own survival -- our oceans. Because when you save the whales, you also save the humans. Watch a video and listen to underwater recordings of the 2003 sonar tests off the Pacific Northwest. Watch the NRDC video, "Lethal Sound " on sonar's effects on marine life. Watch PBS, "Ocean Giants" for in-depth look at military sonar. 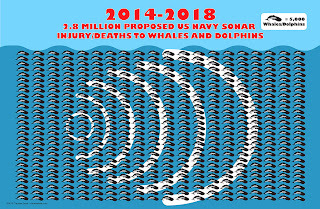 Sign a petition to make your voice heard in the public comment, ending March 11th on the Navy's expanded sonar testing for 2014-2018. If the US Navy is experimenting and is consciously going to great heights in destroying our planet, then there must be something beyond our imagination. Something extremely secretive that they won't divulge no matter what to the detriment of our living planet. In what monstrous savage barbarian world are we living in?